Stay warm with our 10-year warranty on furnace parts! 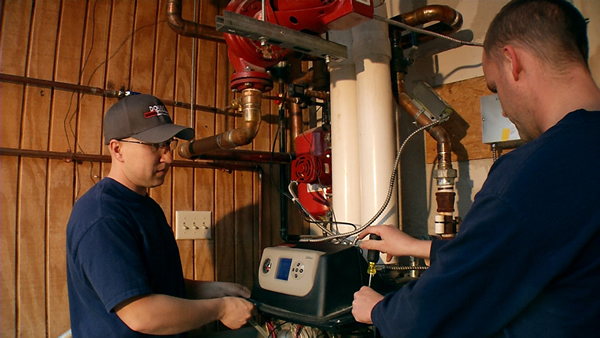 Boilers offer a long life and up to 98 percent efficiency. They can also be quite compact, saving space and money spent on natural gas. They have regained popularity in homes and businesses due to the consistent, efficient warmth they provide. Today’s condensing boilers contain technology designed to recover heat as it is discharged for greater efficiency. Gas conventional boilers are also available to save fuel and heat large homes and businesses. Select boiler models can also provide the hot water you use for bathing and cleaning. A boiler can heat large spaces very efficiently. For example, radiant in-floor heat uses warm water in pipes beneath your floor to heat a space. This type of boiler-based heating system is always on, with the heat rising up to keep you warm. The heat is more constant and less drying than blown air heating systems. Doug’s Heating & Air Conditioning services all brands of boilers for homes and businesses, and we sell, install and service Buderus, Bosch and Weil-McClain boilers. To learn more, please contact us.